The first match has some stuttering sound issues (it also loses the video for about a minute) but the rest looked like they were ok. 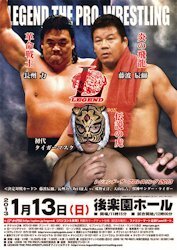 I just got done reviewing this event for my site, but to summarize: Ishii/Okabayashi is great, everything else I'd only recommend if you see a wrestler in it you already enjoy anyway. Some of the other matches were solid but I wouldn't consider them must-see. But do watch the Ishii/Okabayashi match.